Phone in to take part in PHOWN ! PHOWN (Photos of Weaver Nests; pronounced "phone") is a new ADU Virtual Museum project, where weaver nests or colonies may be photographed and submitted. To take part in this project, you need to register as an ADU participant. 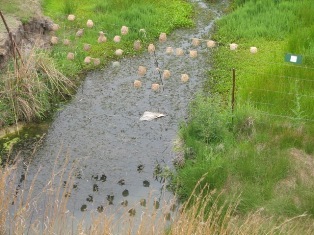 Then find weaver nests and take photos and count the nests. Read more details about how to take part by reading here. Any weaver species (Ploceidae family) may be photographed, including introduced populations that breed naturally in the wild. You can also take part in the other ADU Virtual Museums, all designed by Rene Navarro. You can view submissions (without being registered) by going here. There are different search possibilities - explore these yourself! There are already 23 records of a variety of southern African weavers. The first one submitted was by Les Underhill of Southern Masked Weavers breeding on a barbed wire fence.